Piezo Tip/Tilt Positioner, 2-Axis Rotation . This piezo stage is designed to rotate optics and mirrors around 2 axes with a common, fixed pivot point. 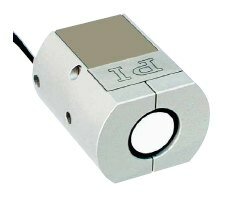 Its compact design, stiiff piezo drives and frictionless flexure guiding system allow for very high resolution and speed. Integrated position sensors provide feedback for closed-loop operation. Vacuum compatible piezo tip-tilt stages are available on request. More information on piezo rotators and tip/tilt positioners.